The CAN I/O X provides manual transmissions and mechanical engines a means to connect with electronic instrumentation by bringing sensor or generator input to the J1939 CAN data bus. 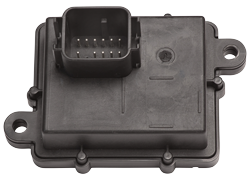 Built to rugged automotive grade requirements, CAN I/OX is sealed to IP67 and can be placed anywhere on the vehicle. AMETEK VIS’ CAN I/O Expander Module (CAN I/O X) is part of the family of CAN Interface Modules used to enhance a complete vehicle instrumentation system. CAN I/O X provides manual transmissions and mechanical engines a means to connect with electronic instrumentation by converting pulsed inputs to digital information. The module also provides switched and analog inputs that can be converted to digital data. The converted data is broadcast out on the J1939 CAN data bus at regular intervals. The CAN I/O X module is sealed to IP67 specifications and can be mounted on the vehicle chassis. Designed to withstand harsh conditions typical of off-road environments, CAN I/O X meets all SAE J1455 and J1113 requirements for vehicular instrumentation.